Las Vegas, NV—Marking the 60th year since the first atomic bomb was tested on land belonging to the Western Shoshone National Council, near Indian Springs, Nevada, eight activists stepped onto the land and were immediately arrested by Nye County police. The Western Shoshone National Council had issued permits for the activists to enter their land. “You bless the land with each of your footsteps,” said Johnnie Bobb, a leader of the Western Shoshone Nation. Taken into custody immediately after stepping onto the land were: George Homanich, Judy Homanich, Mary Lou Anderson, Renee Espeland, Brian Terrell, Denis DuVall, Jim Haber and Jerry Zawada. Jim Haber, coordinator of the Nevada Desert Experience, noted that the Nye County Sherriff’s office accepted as valid forms of identification the permits issued to the activists by the Western Shoshone National Council. A Las Vegas judge on Thursday handed down a decision that got a mixed reaction from protesters of drone warfare who were arrested for trespassing nearly two years ago at Creech Air Force Base in Southern Nevada. Judge William Jansen, in a 20-page decision, ruled that the “Creech 14” who protested April 9, 2009, at the base, were guilty of the crime of trespassing. But the judge also decided that the defendants, who stood trial for the misdemeanor offense last September in his courtroom, would be given credit for the time they served in jail and would be free to go. “Go in peace,” were Jansen’s final words to the defendants after an hour-long court proceeding this morning in Las Vegas Justice Court. The judge also urged them to use diplomacy, rather than trespassing, in their attempts to get U.S. drone warfare policy changed. There was some scattered applause in the crowded courtroom upon hearing the defendants wouldn’t get jail time — but the defendants weren’t pleased about the judge’s guilty verdict. The protesters had argued there was “necessity” that compelled them to act. As someone might trespass onto private property to save a child from a burning building, they said they were trying to stop drone warfare from killing civilians thousands of miles away in Afghanistan. Before handing down sentences, the judge allowed each of the defendants to make statements. Each of those who spoke said they disagreed that what they were doing wasn’t out of necessity. Those found guilty of the misdemeanor charge are the Rev. John Dear, a Jesuit priest; Dennis DuVall; Renee Espeland; Judy Homanich; Kathy Kelly; the Rev. Steve Kelly, a Jesuit priest; Mariah Klusmire; Brad Lyttle; Libby Pappalardo; Sister Megan Rice, a member of the Sisters of the Holy Child Jesus; Brian Terrell; Eve Tetaz; and the Revs. Louie Vitale and Jerry Zawada, both Franscican priests. The Creech 14 were arrested in April 2009, the State of Nevada prosecuted the case on September 14th 2010. The judge recognized the social justice significance and decided to withhold judgement for at least 90 days. Come hear his announcement with the Creech 14 at the Regional Justice Center, 200 Lewis Ave., Las Vegas, (8th Floor). That will coincidentally be the 60th anniversary of nuclear testing at the Nevada National Security Site (NNSS–formerly the NTS/NPG). January 27 from 7:30 to 8:15am: Pre-verdict rally @ Lewis St and 3rd (outside Regional Justice Center). This rally/vigil happens just prior to the court hearing in which Hon. William Jansen will pronounce his verdict–4 months and 13 days after the trial ended. January 28 from 6:30 to 8:00am & 3:30 to 5:00pm: Vigils at Creech Air Force Base in opposition to remote-controlled “hunter-killer drones” from Indian Springs. 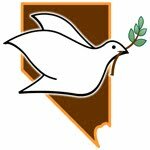 January 29 from 11am to 1pm: Prayerful Memorial Observance of the 60th Anniversary of 1st Nuclear Bomb Test in NV. This event is @ the entrance to the Nevada National Security Site (formerly called the Nevada Test Site)–Mercury exit of US-95, 65 miles northwest of Vegas. The actual anniversary is January 27th, but our Memorial Observance is January 29th. What started out as an open-and shut case of trespass in Judge William D. Jansen’s Las Vegas courtroom yesterday soon turned into a day-long reflection on the right of citizens to break the law in order to uphold a higher one. Fr. Louie Vitale, OFM and thirteen others – including Nobel Peace Prize nominee Kathy Kelly and Fr. John Dear – were on trial for entering Creech Air Force Base in April 2009. They had gone to the base to dialogue with soldiers who direct drone bombings from video monitors in the Nevada desert. Instead, they were arrested. The judge allowed the defense to put on a series of witnesses who soon engaged both the judge and prosecutor in a powerful conversation on the appropriateness of civil disobedience. These witnesses included Former US Attorney General Ramsey Clark, retired colonel and State Department Ann Wright (who established the US embassy in Kabul and who resigned from the department when the US invaded Iraq), and Bill Quigley, legal director of the Center for Constitutional Rights. The judge listened closely to the arguments and acknowledged that many important issues had been raised. Unexpectedly, he told the packed courtroom that he would take all the testimony under advisement and would take some time to carefully consider all the questions involved in balancing the tension between law and justice. Today, September 14th, fourteen of us — including four priests — stand trial in the state courthouse in Las Vegas, Nev. on charges of criminal trespassing. The government seeks to jail us for walking onto Creech Air Force Base on Holy Thursday last April. We walked onto the base — which is about an hour northwest of Las Vegas — with nothing but a prayer and a call for an end of the U.S. drone fighter bomber program, which is headquartered there. We went to Creech in a spirit of gentleness, but also of protest. It’s time for the U.S. to end its killing of our brothers and sisters in Afghanistan, Pakistan and Iraq. Needless to say, our call — and the gift we offered of a letter, roses and pizza — were rejected. The police arrested us and put us in handcuffs. Then they hauled us to Las Vegas and booked and tossed us for the night in to the local jail. The next day — Good Friday — they set us free. But now the government is intent on pressing full charges, hoping to put an end to this anti-drone movement. A nation whose foundation is militarism and war cannot brook dissenters from a different moral order. It’s an old story. Punish those who nonviolently speak out for justice and peace. Incarcerate those who stand up or sit in. Perhaps that will snuff out the fires of the peace movement. But thank God, as Dr. King once said, truth crushed to earth always rises. Active nonviolence spreads like a contagion. Love and truth break through like blades of grass through cracked pavement. Hidden movements begin to flourish — movements of transformation, disarmament and healing. Our drones go on bombing and killing innocent people in Afghanistan, Iraq and Pakistan. So we went to Creech, walked on to the base and knelt down in prayer. And now we go to court in a spirit of creative nonviolence and even in court we’ll denounce these inhuman death machines and call for their abolition. We go because we have no choice. We will begin the day today with a rally and march to the courthouse. In court, we intend to argue that, under international law, we are obliged to oppose these “Unmanned Aerial Vehicles” — the official name for the drones. We also plan to show the court that by entering the base we were enacting our first amendment right to assemble peaceably for redress of grievances. “When we read in the paper about these robotic attacks we are usually told where the drone strike took place and how many militants were killed,” co-defendant Kathy Kelly wrote the other day. “But then it often turns out that the victims were simply local people, not militants in any sense. The blood and the smell of charred bodies are realities on the ground, but are simply small images on a screen in front of the drone operator on the air force base. I believe the American people need to know what we are doing, and understand why the people of Pakistan and Afghanistan cannot see us as part of the solution. This is why I want to focus attention on the drones, and why I am willing to appear here in the courtroom. The other co-defendants for the action at Creech Air Force Base are: Dennis DuVall; Renee Espeland; Judy Homanich; Jesuit Fr. Steve Kelly; Mariah Klusmire; Brad Lyttle; Libby Pappalardo; Society of the Holy Child Jesus Sr. Megan Rice; Brian Terrell; Eve Tetaz; Franciscan Fr. Louie Vitale; and Franciscan Fr. Jerry Zawada. Vitale was recently released after six months in prison for protesting the “School of the Americas” in Fort Benning, Ga., now formally known as the Western Hemisphere Institute for Security Cooperation. Kelly was informed last week that the federal government has placed felony charges against him and four other activists for a plowshares disarmament action at the Trident submarine base near Seattle, Wash. last November. He and the others face ten years in prison. Another co-defendant has an upcoming trial for protesting weapons testing at Vandenberg Air Force Base near Santa Barbara, Calif.
As P.W. Singer writes in Wired for War: the Robotics Revolution and Conflict in the 21st Century, unmanned aerial vehicles like the MQ-9 Reaper drone are used by the Pentagon not only for surveillance — but to kill and blow up buildings in Iraq and Afghanistan. Defying international law, the CIA uses the Reaper to assassinate and blow up buildings in Pakistan. The Pentagon and CIA adore these new weapons. With no pilot or crew, no U.S. military officers can be injured or killed. They can be directed by young officers thousands of miles away. Forty other nations are racing to develop similar drone programs. On the day of our action drones flew low in front of us for hours. It was an astonishing sight to see these black predators hovering over the beautiful Nevada desert. What terror must they invoke as they fly over the villages of the helpless poor in Afghanistan, Pakistan and Iraq? The drones are the sons of nuclear weapons. They offer a bleak future — a sky full of black death, hovering over the earth. Our modest gesture — prayer, roses, and of course, pizza — advocated another future, a future of peace without drones or nuclear weapons. If the judge allows our great friends to offer expert testimony we will hear in detail what these drones are doing — and how they violate international law and the Nuremberg Principles. But I’m also concerned with what they are doing to us. Since violence is a downward spiral their unimaginable destruction will certainly come back upon us like a boomerang. One day, I fear, drones will fly over our own country. More, they signal our spiritual death — the loss of our humanity. The children of Afghanistan, Pakistan and Iraq do not threaten us; it’s this self-destructive spirit of war within and among us which is killing us. We need to repent of these weapons and discover a new spirit of love and compassion within us. Being hauled into court, Jesus taught, is our chance to give witness. If I’m able to take the stand I’ll testify that I went to Creech Air Force Base because I’m a follower of the nonviolent Jesus who went to Jerusalem and confronted his empire. My friends and I were trying to do the same. I’ll cite the nonviolent Jesus as my expert. “Love your enemies that you will be sons and daughters of the God who lets the sun shine on the good and the bad and allows the rain to fall on the just and the unjust,” Jesus taught in the Sermon on the Mount. If we continue to kill our enemies and rain bombs down upon them, I’ll say, we are not sons and daughters of the God of universal love. We are, rather, sons and daughters of the false gods of death. I will then urge the judge to dismiss the charges or find us not guilty and join our campaign to rid the planet of these weapons, that we might be peacemakers — sons and daughters of the God of universal love and peace. After that I’ll invite the judge to join us for pizza. Why not? We live eternally in hope. Alas, such talk will probably not be allowed. In that case, our witness will be our nonviolent presence — the love in our hearts for unseen sisters and brothers in Afghanistan, Iraq and Pakistan. Today, as we prepare for trial, please join us in prayer. The “Creech 14” went to trial on September 14, 2010 in Clark County Regional Court in Las Vegas, Nevada. 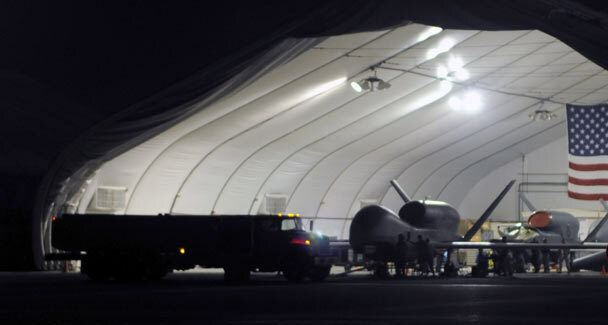 The case originated during a week of demonstrations and vigils in April 2009, when the activists entered Creech Air Force Base in Indian Springs to highlight the serious injustice of the U.S. military’s use of drones, or Unmanned Aerial Vehicles (UAVs) in Afghanistan and elsewhere. Crews at Creech control the drones used in these expanding wars, including killing civilians in remote controlled assassination attacks. The protesters were charged with trespassing. Judge William Jansen scheduled the verdict for January 27, 2011. Judge Jansen allowed the pro-se defendants to call three expert witnesses – former Attorney General Ramsey Clark, retired Col. and former Embassy Official Ann Wright, and Bill Quigley, Legal Director of the Center for Constitutional Rights. – Intentional killing is a war crime, as embodied in U.S. constitutional law. – Drone strikes by U.S. and coalition forces kill a disproportionate number of civilians. – People have the right, even the duty, to stop war crimes. – According to the Nuremberg principles, individuals are required to disobey domestic orders that cause crimes against humanity. Defendant Brian Terrell delivered the group’s closing statement. Referring to earlier mention of a classic metaphor used in cases invoking the necessity defense, he depicted a house on fire, with a baby trapped inside. “The house is on fire; the baby is in the house,” said Terrell, “We fourteen are ones who see the smoke, and will not allow a ‘no trespass’ sign to stop us from reaching burning children.” Terrell was speaking about the civilian deaths caused by U.S. drones in Afghanistan. The Creech 14 include Fr. John Dear, SJ; Dennis DuVall; Renee Espeland; Judy Homanich; Kathy Kelly; Fr. Steve Kelly, SJ; Mariah Klusmire; Brad Lyttle; Libby Pappalardo; Sr. Megan Rice, SHCJ; Brian Terrell; Eve Tetaz; Fr. Louie Vitale, OFM; and Fr. Jerry Zawada, OFM.